Two teams hopeful for a revival will field against each other at the Jawaharlal Nehru Stadium of Kochi as Pune City faces Kerala Blasters in the Friday encounter. Kerala Blasters showed great improvement in their last match against Jamshedpur FC at home. Although the result was not satisfying, the performance was appreciated, even from the fan groups who boycotted the match. Blasters are currently 7th on the points table with 9 matches. David James' team has played 10 matches, out of which they tasted victory only once. Nothing less than the 3 points would keep their chances alive, at a situation like this. Pune City is just the opposite of who they were last season. In the 2017-18 season, they had conceded 21 goals in total. The Stallions have allowed the same number of goals already, from the 10 matches. Their last match, against Bengaluru FC kept the players hopped up until a late equalizer from the Blues. Pune City has only 5 points, from their one win and two draws and are 9th on the points table. Even if it is a tough ask, Pune might be determined to keep the spirits alive. Courage Pekuson is expected to start in place of Keziron Kizito. Otherwise, David James wouldn't do much alterations to the balanced side that faced Jamshedpur FC. 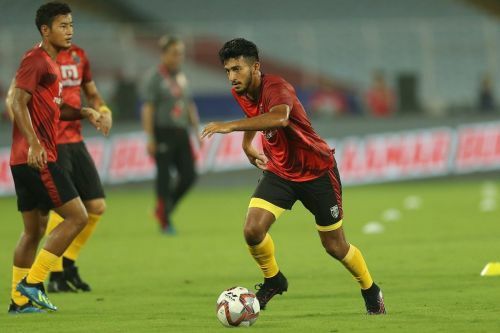 Sahil Panwar might make a comeback to the starting XI. Robin Singh remains a doubtful inclusion and if replaced would mostly be Nikhil Poojari. To strengthen the attacks Iain Hume might be given a chance. Sahal Abdul Samad has been ruling the midfield for Kerala Blasters. The young local boy has featured regularly from the very first match of the season and will be crucial in the Pune encounter. Sahal's dangerous balls leading to the attack will be of great use to the hosts. The counterpart from Pune City will be another Kerala boy - Ashique Kuruniyan. The 21-year old winger has been outstanding in an otherwise poor performance of the Stallions this season. Ashique has scored 1 goal, but came close on various other occasions. Both the teams have lacked wins - just 1 from their 10 outings. As Blasters have more draws, they stand higher on the table, which will help them with some confidence. The recent performances and level of confidence show signs of the hosts registering their second victory.